Sightseeing tours - To really get to know and appreciate Lübeck, we recommend hiring the service of our local partner: a professional and passionate tour guide to show you around the town, entertain you and share his knowledge. 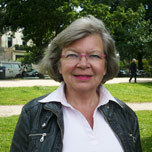 All partners in the cities presented by LatLon-Europe are expert tour guides and passionate about their job. Denise Faessel in charge of the guided tours at Hamburg, Lübeck, Breme, so please, contact him directly to book your personal guided tour. Lübeck is a city in northern Germany . It was the leading city of the Hanseatic League , and because of its Brick Gothic architecture is listed by UNESCO as a World Heritage Site . 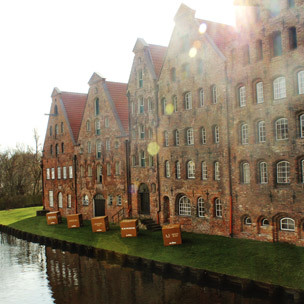 The old part of Lübeck is on an island enclosed by the Trave and the Wakenitz . 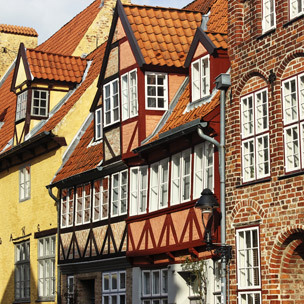 You will discover the charming old town which has been declared a UNESCO World Heritage Site: the elegant XV century alleyways and ground courtyards that pay testament to when the Hanseatic League was a booming trade center. Admire the world-famous brick gothic Holsten Gate, the seven spires of the city’s five churches, the Hospital of the Holy Ghost which dates back to 1280 and St. Mary's Church – home to the world's largest mechanical organ. You will discover the charming Old Town which has been declared a World Cultural Heritage Site in 1987. 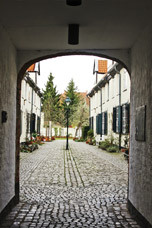 During the walking tour you will have a look at the historic alleyways and courtyards, which are remnants of late 15th century. You will see the red brick gothic world-famous Holsten Gate, the seven spires, the Hospital of the Holy Ghost dating back to 1280, the historic Town Hall, the market place and St. Mary’s Church - home to the world's largest mechanical organ. 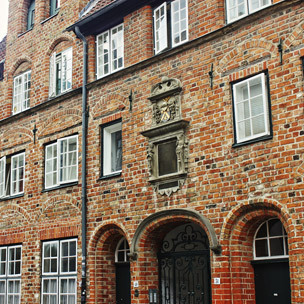 Following you will have a look at the Buddenbrook House, former home of the Lubeck-born authors Heinrich and Thomas Mann. The St Jacobi Church, the church of the seamen und fishermen. 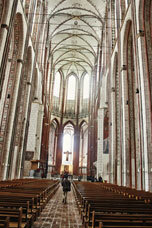 The St Ann museum has a wounderfull collection of altar pieces from Lübeck und surroundings. Make sure not to miss the Marzipan-exhibition in the Café Niederegger. I make you discover other hanseatic cities: Hamburg, Bremen, Lüneburg, Rostock, Wismar, Stralsund but also Schwerin, the Baltic coast, the surroundings of Lübeck, Eutin, the city of the roses and the composer Carl Maria von Weber, but also the old castles, wonderful lakes and unspoiled nature. Our website with tourist information about Hamburg is already online.